Give the gift of better golf this holiday season with great packages to choose from. The Indoor Academy is open December 1, 2018 through March 31, 2019. - 10 30-minute private lessons (must be used by March 25, 2017). - Winter golf membership at Glen Abbey (one-hour per day). - Package of 10 includes access to the Foresight Launch Monitor. - The leading edge robotic teaching system that helps golfers level find and feel that perfect swing. Our instruction programs make great gifts! Ask us about purchasing a lesson certificate for a gift or stocking stuffer. 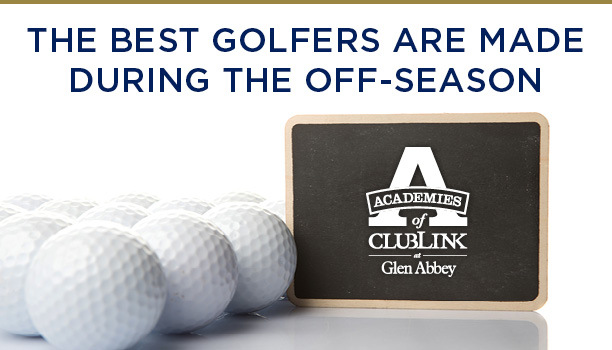 For more information, please contact us at 905-844-1902 or gaacademy@clublink.ca.